Jane Brocket's Vintage Cakes book never fails. These are almond slices: a little more complicated than your average bar cookie, but worth it. 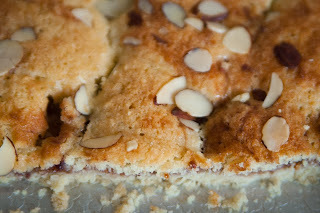 A shortbread base, then a layer of raspberry jam, then a layer of almond-sugar-egg goodness, then a sprinkling of almonds. oooh, I pinned a recipe that looks similar. Looks great. Is the book in American/Imperial measurements or metric? Mostly American, with a few metric weights that slipped through the proofreader! Oh, I recognize this recipe! We made it in Jr Hi cooking class; my teacher called them "Christmas Jam Bars". I made them for Christmas for many years, and then I forgot about them. Time to pull out the recipe. Are these made gluten-free? If so, what flours did you use? Farrah, these aren't gluten free. They have a flour-sugar-butter-almond flour base.